Photos by Rick from Winnipeg, Manitoba, Canada. The thought of a garden bridge conjures up images of exotic worlds and mystical moonlight strolls so it's no small wonder that so many choose to add garden bridges to their yards and over their water features. Who wouldn't want this beautiful landscape feature gracing their yards? Adding a garden bridge can be relatively easy for those who research and plan within their abilities. In fact there are many garden bridge kits complete to the smallest nail for gardeners and enthusiasts to purchase but, before you do, take the time to learn about the different styles of garden bridges so you can make the best choice for your lawn or back yard garden pond. 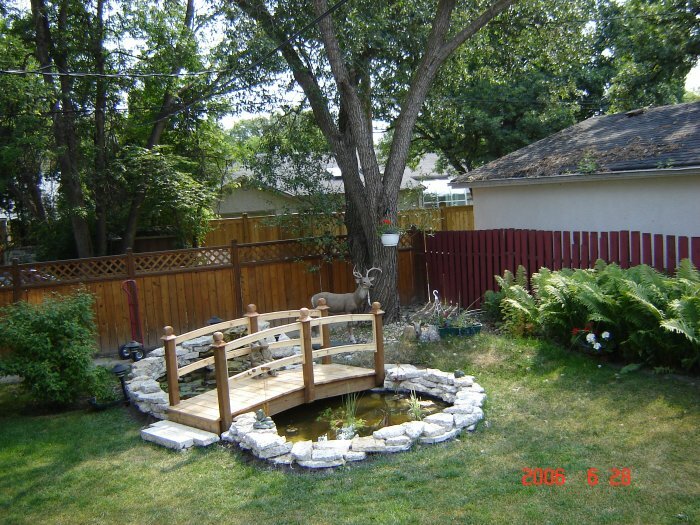 There are three main types of rustic or natural bridges that can be considered for the yard: Log bridges, zig zag bridges, and stepping stones. The log bridge consists of several logs held together with sturdy rope, strung across the pond. Think Indiana Jones crossing the rope bridge in The Temple of Doom when you try to imagine this one, except this bridge is a lot smaller, and it's not meant to be walked across. Zig zag bridges are great fun and make a unique decorative addition to your bog garden. They are simply wooden planks placed at zig zag angles end over end. Lastly stepping stones are either slabs of slate placed equidistant from each other in a line across a pond or bog garden, or they can be carved stone blocks laid flush against each other for a more formal look. Stepping stones may be the easiest type of bridge to place in your garden. The two basic types of what we would traditionally view as a constructed bridge are the Japanese bridge and the moon bridge, which is a type of oriental garden bridge. There are four types of Japanese bridges used in the traditional oriental garden. Most often slabs of uncut stone are used in a form of stepping stone bridge but also used are Kibashi or bridges made of logs laid parallel with a simple truss-work frame. Moon bridges are the third type of Japanese bridges but they can also be found in many other types of gardens. They are very easy to spot because they have a high arch that lifts them up over a small pond or garden in a half-moon shape. They can be made to be used or just to serve as decorative accents and come in many sizes for this reason. The moon bridge is fun to have in the garden since the user of the bridge almost has to climb up the steps and back down the other side to cross. 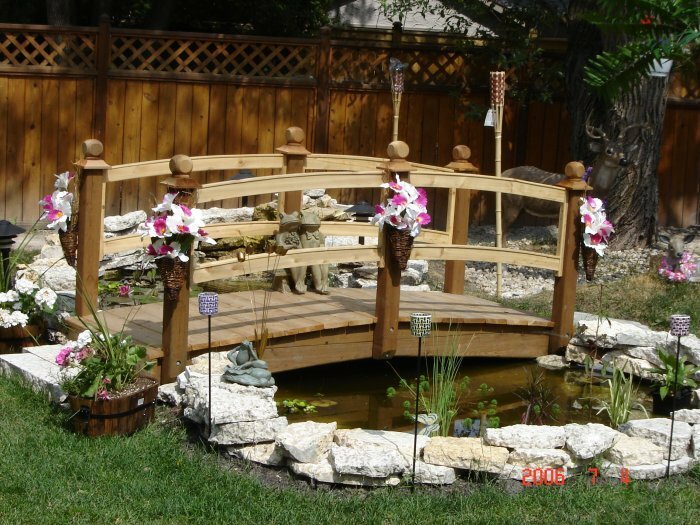 The Japanese arched bridge is probably the most common type of bridge seen in garden landscapes. It's often a wooden bridge with railings built with a gentle arch over water. These bridges can feature themed oriental detailing and carvings. In deciding the right type of bridge, all you really need to focus on is your overall garden style and your own personal tastes. It's important to know whether you will want to use the bridge or if it can simply be decorative. You'll also want to take measurements before ordering a bridge kit so the bridge will be large enough to span a pond or a garden area. Garth Epp is the host of the Smarter Water Garden Advisor Series POD Cast and publisher of Building My Pond.com, a supportive online ponding community. Rick's pond with a nice bridge. Some typical pond bridges for sale. Click for more information.